It’s arrived. A new member of the family joins the legendary Sharpy from Clay Paky: it imitates its speed, weight and size but fills the space beyond 6 degrees making it the obvious choice to complement the Sharpy’s beam capacity. With a range from 6.5 to 50 degrees the Sharpy Wash is designed by the boffins at the Clay Paky optical lab to be the flip-side to the Sharpy coin. The 330W lamp equals the output of a 1000W luminaire and weighing in at only 18.5kg it is the ideal touring unit. Like its older brother, the Sharpy Wash appeals to end users across the whole of the live event and installation industry as Ambersphere’s order book confirms. From TV lighting specialists and corporate event suppliers through to companies that supply rigs ranging from the more modest touring productions through to the gargantuan sized event, the Sharpy Wash has generated interest from all. Richard Martin Lighting supplies lights to the very demanding and continuously developing TV market. 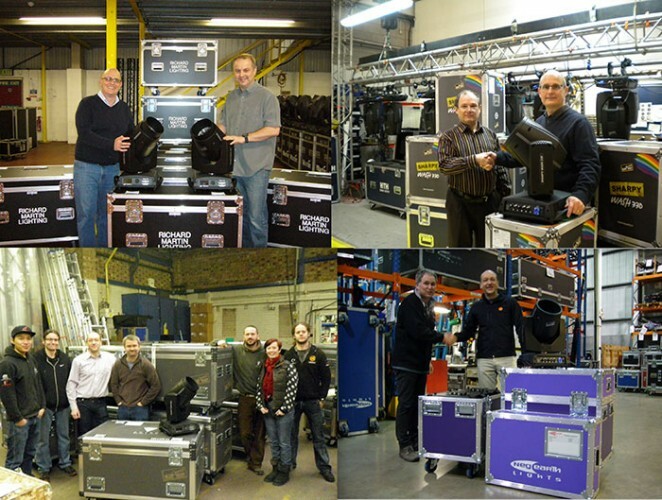 As a moving light specialist the company needs to react quickly when new product becomes available. “From the success of the Sharpy we knew that the Sharpy Wash would be at the forefront of innovation and become one of the trendsetting products of the year,” says marketing coordinator, Gemma Jaques. With the successful delivery of this new member to the family, the Sharpy dynasty now has all bases covered. From all sectors of the market: from the smallest corporate unveiling to the biggest live music festival, the little dynamite package that is the Sharpy Wash 330 has already made its mark. In picture clockwise from top left: Ambersphere’s MD Glyn O’Donoghue, Steve Wells of Richard Martin Lighting, Martin Hawthorn of Hawthorn Theatrical, Sudip Shrestha, Peter Schofield, Philip Norfolk (Ambersphere), Adam Stevenson, James Hughes, Noreen O’Riordan, Will Wright of Entec, Dave Ridgway of Neg Earth Lights.